In the summer Mom let me roam the candy aisle at the gas station while she bought wine and lotto. I always got to take home a treat for after dinner, when Mom would watch her shows until bedtime. I got to know every sour patch kid in the pack and tried every kind of sour fruit. I had a dozen neon green frogs named gummy and an army of Jolly Ranchers and Warheads. I saved all the reds for Sis, because they were her favorites. They stained her lips pretty and it made her even prettier. Sis had a boyfriend who she said had dreamy blue eyes. I didn’t know why she thought they were so dreamy, but I never asked, either. Sis knew all about boys and especially the dreamy ones, so I guessed she must be right. She said she knew so much because she wasn’t a kid, and maybe I would too sooner or later if I grew up a little. Dreamy came to see Sis every day before she got sick, and sometimes he even stayed for dinner. Mom didn’t like him being at our house and she made sure Sis knew it. Mom said Sis was wasting her time on a guy like him, but Sis just told her to stop being so mean. He didn’t go to school, but Sis said it didn’t matter since he was so dreamy. Mom didn’t think he was dreamy. She hated him so much she was glad when Sis got sick, because then he stopped coming over so much. Mom knew Sis was going to be fine, I guess. Sis wore jean skirts with Chucks, and she had hair longer than I’d ever seen on anyone. Her nails were hard and red and never, ever chipped. She was so tall she looked like a model, and she knew it. I didn’t look like any kind of model. Mom didn’t let me paint my nails yet, and she still cut my hair all the way up to my shoulders. My tummy popped out like a cereal bowl. I thought it looked kind of like there was a baby in there, so I didn’t mind. I lied and told Sis there was one, but I hadn’t found a boy to be the daddy yet. Truthfully I didn’t think it needed a daddy, but Sis didn’t believe me anyways, so it didn’t really matter. Sis didn’t want anyone to know she was sick, but we all heard her tell Dreamy. I was laying down in the living room because it was too hot outside and dinner was soon anyways. Mom was in the kitchen fixing dinner, and Daddy was in there with her. Really Daddy was Mom’s boyfriend, but she said to call him Daddy, so it’s natural in the eyes of the Lord. She said I should be happy to call him that, since lots of little girls don’t even have one Daddy, and here I was lucky enough to have two. “Are you sure?” Dreamy asked Sis so loud I knew something was wrong. He asked her if she was going to get it taken care of, and she started crying like I’d never heard. He said she had to, she had to, and what would they do if she didn’t? She kept telling him to shut up, just shut up already, but he wouldn’t. And then they were quiet. Dreamy came in the front door a minute later. He must have gone out Sis’s window and walked around the house to get back in. His face was all red and there was sweat dripping off him, from yelling or going outside, I couldn’t tell. “You eating dinner with us?” Mom asked him. She had her eyebrows raised higher than I’d ever seen, looking at him like he better go home. He told her he wasn’t, and Sis wasn’t going to either because she was sick. Daddy laughed and asked Dreamy to tell us what exactly Sis was sick with. Dreamy blushed blue but didn’t say a word. Mom stayed staring at him all quiet and he knew she wanted him out. I watched from the living room until he was gone, looking down at my pretend baby in my belly and thinking that I was never going to make it have a daddy, much less two of them. I let him kiss me one night a couple days before Sis went to the doctor. He came to my room after banging on Sis’s door and said I had to walk him home or he’d be scared since it was getting dark out. I thought that was pretty silly, since he was a boy and a teenager for that matter. I went out on the porch with him, because I wasn’t scared and I wanted him to know it. He looked madder than anything, sweating and breathing all heavy. Sis hadn’t let him check on her. He tried every couple of weeks, but she hadn’t said a word to him since she got sick. I thought that was just plain rude, but I never said anything about it. I guessed she didn’t like him doing that because she could take care of herself and didn’t need him for anything. He’d always come to my room after hers all red-faced and shaking and talk to me. He’d ask me what Sis was so cut up about, and how come girls were so in-mature? I’d shrug and he’d go on asking me stuff. Why did Sis have to be so stubborn? Didn’t she know how easy it would be? I never answered him. Mom always said Sis would wise up and ditch him eventually, but I wasn’t going to tell him that. I’d just keep my mouth shut and pretend I was a grown up and Sis was a kid and he was my Dreamy Blue Eyes. It was so hot outside on the porch I was dizzy and everything shimmered like it wasn’t real, like in a minute I’d wake up all sweaty in bed with the blankets on the floor. I could hear mom’s shows playing loud inside, like every night. I could picture her laying back with a cup of wine and her feet up, and Daddy sitting in his chair with a Pearl. No doubt the dishes were all stacked up in the sink for later. I prayed Mom wouldn’t see us. She was always saying she didn’t care what Sis did anymore, so long as it didn’t include Dreamy. I was certainly including him, and I knew she’d care something awful. I kept one ear on the TV inside and thought as soon as it went quiet, I’d kick Dreamy right off the porch. Mom didn’t see us, and afterwards Dreamy left all by himself. That was fine by me, as long as he knew I really was going to go with him. As long as he knew I had the guts for it, and I wasn’t some kid. It was loud when I came back in the living room with The Price is Right on and Mom yelling out numbers like crazy and Daddy always laughing when she did. “625! It’s six hundred and twenty five, dammit!” She’d yell, and Daddy would laugh out loud and say, “Hush up wild child,” but go on laughing anyways. My candy from the gas station was sitting on the couch by Mom’s feet. I let it stay there, so I wouldn’t interrupt, even though it was Lemon Heads, which were my favorite. I did the dishes while I waited for her shows to end, just to be nice. I kept imagining Sis coming down the hall like she used to. I wished she would, so she would wash the dishes and I could just dry them and she’d tell me stuff about boys and clothes and growing up. I knew she wasn’t going to, though, so I washed them myself and thought about my kiss and how lucky I was Mom didn’t see me. When I was sure everyone was asleep, I went back outside to eat my Lemon Heads and look at the stars. I sat on the edge of the porch right where Dreamy had kissed me. My lips were all chapped, and I wondered if his were too. I tried to bring him back with my thoughts and making my lips wet how they were. I dedicated each Lemon Head to a message for him, sucking on it until it was nothing and then coming up with another one. I would’ve walked you home, I thought, I wouldn’t have got scared. And then I’d pop another candy in my mouth. Maybe I’m going to have a baby one day, and you can’t be its daddy. Sis came up behind me on the porch, and I just about screamed. She hadn’t left her room all day or maybe even longer. She never went outside or did anything since she got sick, just sat in her room all sad and tired and doing whatever she did in there by herself. She asked how come I was outside so late; didn’t I know it was dangerous out? I told her I wasn’t scared, and I think she believed me. She looked scared though, her eyes all dark and her mouth all small and quivering. Her hair was tangled up in a knot and her lips weren’t stained red even a little. I asked her if she wanted a Lemon Head and she said no, because candy is for kids, and that wasn’t her. I wanted to tell her something to prove I wasn’t some kid either. I wanted to tell her about what happened, how I let him kiss me and I didn’t even get scared. About how I was going to have a baby one day, and we wouldn’t need anyone to take care of us. But I didn’t say anything to her about it. I looked at her hard like I knew something, and hoped she’d understand. She just laughed and asked how come I’m so weird. I kept my mouth shut and shrugged, because what was I supposed to say? She sat with me for a while, staying as quiet as I was and looking at the stars. It was so hot I could see the sweat glittering on her face. It’d gotten hotter every day since summer began, like if it didn’t stop we’d all burn up before school started. I handed her my box of Lemon Heads and she popped one in her mouth. “Do you know where Daddy is?” She asked me. “Where our real Daddy is?” She asked. “Who cares? We have two. And one’s right inside if you need something.” I didn’t believe it one bit, but I said it. She just shook her head. She asked if I was worried about her, and I shrugged. “I’m going to the doctor next week,” she said, staring at me. “You think he’ll come see me after that?” I knew he wouldn’t. I knew she wanted me to say it, too, but I didn’t. She took a couple more puffs and asked me what I had to be so quiet about. She wanted me to know just how sad she was and how I didn’t know a thing about it. She said I was so oblivious, and asked if I even knew what that word means, and was I even listening? But I still wouldn’t talk. Really I was just licking my lips and thinking about how warm Dreamy’s mouth was and how his hand hurt my neck a little and I couldn’t breathe when he kissed me, but I liked it good enough. I’d let him do it again tomorrow. 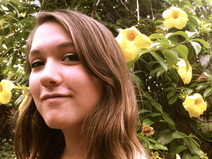 Rebekah Morton is a student at St. Edward's University in Austin, Texas. She is passionate about writing, editing, and people.